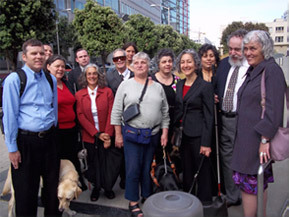 At 9:30 in the morning on July 22, a courtroom in the federal building in San Francisco was filled with blind and visually impaired individuals. They had gathered to hear arguments about whether the website and kiosk accessibility case against JetBlue Airways should be thrown out of court. Judge Joseph Spero asked thoughtful questions and listened carefully to arguments on both sides of the case. He is expected to issue his ruling within the next ninety days. The case against JetBlue was filed in August, 2010 by the California Council of the Blind and three blind JetBlue customers. The plaintiffs are being represented by Linda Dardarian, of the Oakland civil rights firm Goldstein, Demchak, Baller, Borgen and Dardarian, and the Law Office of Lainey Feingold. Linda Dardarian argued the case on behalf of the plaintiffs at the July 22 hearing. The lawsuit alleges that JetBlue has violated California law by maintaining a website and operating airport check-in kiosks that are inaccessible to individuals with visual impairments. The lawsuit is based on three California laws: the Unruh Act, the California Disabled Persons Act, and the California Unfair Competition Law. JetBlue is trying to convince the court that blind people in California cannot use California’s anti-discrimination laws for claims against airlines. JetBlue argues that those claims are “preempted” by federal law governing certain aspects of airline activities. At the hearing on July 22, and in papers previously filed with the court, the plaintiffs argued that the claims are not preempted. Plaintiffs maintain that blind residents of California should be able to rely on the state’s anti-discrimination laws when an airline doing business in California has an inaccessible website or check-in kiosks that blind people cannot use. Further information about the Judge’s ruling in the JetBlue lawsuit, and the case in general, will be posted on LFLegal as soon as it is available. You can also follow the Law Office of Lainey Feingold on Twitter for up-to-date case information, or use the Contact page of this website to let us know you would like to receive JetBlue updates. This is a post about a court hearing. The case was filed by blind people against JetBlue Airways. JetBlue maintains a website that blind people cannot use. JetBlue also operated airport kiosks that are not available to blind customers. Before October 2011, the Judge will decide if the case can go forward.